Harry has sure enough been giving us a whole load of gossip on his personal life as he is spending time in the Australian jungle, however, his thoughts on his son Jamie’s ex-wife, Louise Redknapp have truly caught the attention of fans. On the first night in camp, we even had the story of when Harry embarrassingly thought Prince Harry was one of his players. 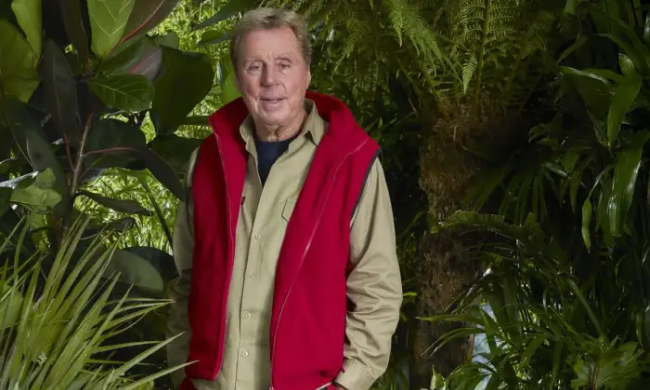 Prince Harry went to acknowledge Redknapp before the football legend simply greeted him with ‘alright mate’ and carried on reading his newspaper – awkward. Viewers have also seen an adorable side of Harry over the past few days, in which he is regularly shown gushing about his wife, Sandra in several conversations with his fellow campmates. It seems as though the bugs, spiders and lack of food aren’t bothering him as much as the fact that Sandra isn’t by his side – it’s just too cute! Before making his way Down Under, he told The Mirror about his fears of being away from her: “That’s the biggest problem I have got. We do everything together. I have been with Sandra for 54 years and I hate being away from her”. He also discussed how he had first met his future wife, in which he plucked up the courage to ask her to dance at the Two Puddings pub in Stratford as a shy 17-year-old. All marriages have their rocky stages, but Harry admits that one of the worst moments of his life was when he almost accidentally ran Sandra over, after her coat got caught in his Range Rover. He also admitted that they have the perfect relationship and have never even spoken a cross word to one another in the whole fifty years of being together. He also confessed that he wouldn’t know what he would do if he didn’t have Sandra, so it seems he has a real challenge ahead of him to try and cope without his beloved wife by his side in the jungle. Their son Jamie Redknapp married Eternal singer, Louise Redknapp in 1998, however, the pair divorced last year which was bound to have caused a rift in the family. Back in April 2017, there were rumours that the couple’s marriage was in trouble. Some said that Jamie feared it was all a result of the dreaded ‘Strictly curse’. A few months later, it was suggested that Louise’s friendship with Daisy Lowe could have triggered doubts in her mind. However, in October 2017, Louise took part in an emotional interview with Stella Magazine, claiming that she felt trapped and had lost her identity in an attempt to be the perfect mum and wife. She still craved the limelight and Strictly had given her that taste of what she had lost. “I have spent most of my life pleasing everyone else, worrying about being judged and thinking I should always do the right thing by staying at home, looking after my kids and my husband. I lost myself.” she told the magazine. “I’d think of my past life as a pop star as being “not reality”. Looking after the house and my family was my reality. I became a sort of Stepford Wife, wanting to be perfect at it. I didn’t want to continue running around after everyone else, and occasionally promoting a yogurt or doing a little TV presenting job. I wanted to sing…I wanted to perform”. The couple divorced in December 2017. In Harry’s autobiography, while the couple were still very much in love, he had been nothing but kind with his words about his former daughter-in-law, stating that she was “the most down-to-earth girl you could hope to meet”. “She may be a popstar temptress to the youngsters who read those laddish magazines, but to me, she’s just a lovely girl who’s married to my youngest son,” he added. “Louise, who made it big with chart-toppers Eternal before becoming a major popstar in her own right, is the least showbizzy person you could imagine. She’s so quiet and shy away from the spotlight that I can’t believe she has the front to go live on stage in front of thousands of people”.